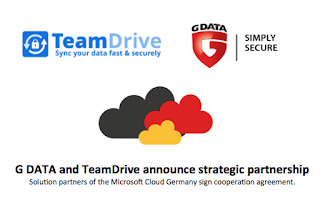 German IT security specialist G DATA Software AG and TeamDrive GmbH have concluded a wide-ranging partnership in the areas of data security and virus protection. Both companies will provide services from the Microsoft Cloud Germany. The partnership is aimed at acquiring new business customers, partners and consumers for Microsoft Cloud Germany. Besides market development, the two companies are planning a technology cooperation. TeamDrive and G DATA presented the first insights into their collaboration at the Microsoft Worldwide Partner Conference in Toronto last week. Data protection, data security and compliance are of critical importance in the era of progressive digitisation of all areas of life and work for private users and businesses. “Besides protection against malware attacks, backing up data is immensely important,” says Andreas Lüning, CTO of G DATA Software AG. 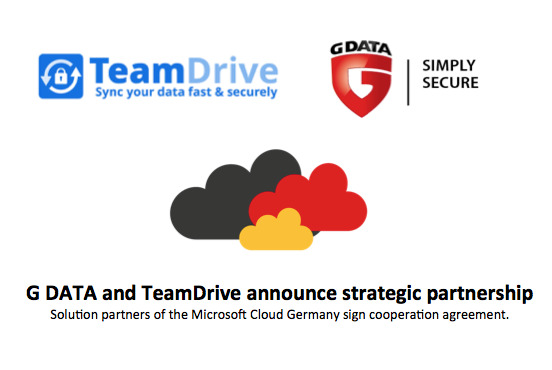 “With Microsoft Cloud Germany, we can offer our customers a Cloud solution that is firstly aligned with the strict German data protection laws and secondly guarantees high security for the data backup.” Initially, integration of the TeamDrive Sync & Share software based on Microsoft Azure into G DATA solutions for private users is planned for the partnership. Additional cooperations in the B2B sector are envisaged. Microsoft will provide the public cloud services Azure, Office 365 and Dynamics CRM in future also from German data centers. The Microsoft Cloud Germany is primarily aimed at organizations in data-sensitive industries, such as the public or the financial sector that are subject to particularly strict compliance guidelines: Data is exchanged between the two data centres in Magdeburg and Frankfurt am Main via a private network isolated from the Internet, guaranteeing retention of the data in Germany. T-Systems, a subsidiary of Deutsche Telekom, is the data trustee that controls access to customers' data. The services will be available in the second half of 2016 to customers in the 28 countries of the European Union and the four members of the European Free Trade Association.